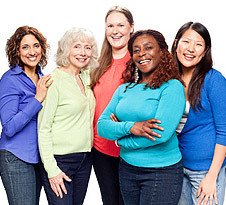 United Regional offers programs and services to help women maintain optimal health throughout all stages of life. Whether you are looking for a gynecologist, want to start a family, or are facing menopause, you’ll find specialized physicians and services to meet the special health needs of women. From adolescence to pregnancy to menopause, a woman’s gender gives her a unique health perspective on life. To find a physician in this medical specialty, please visit our Physician Directory, or contact United Regional Call-a-Nurse at (940) 764-8570 or (800) 982-9799.